This calculator can be used to convert the measurement taken with an oscilloscope to complex impedance and power information. See instructions below. This calculator is designed to take the measurements of a complex load from a two channel oscilloscope and translate them into R, X, Return Loss, VSWR, dissipated power, etc. 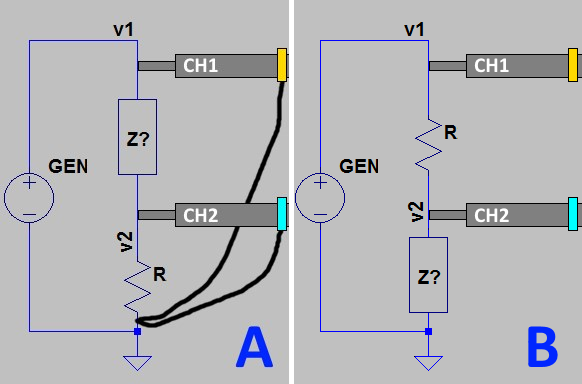 In order to do the measurement, one of these configurations below is needed. When executing the calculation, select “configuration A” or “configuration B” according to your probes configuration. “Z?” is the unknown load. “R” is a known resistor used by channel 2 to measure the current and phase. 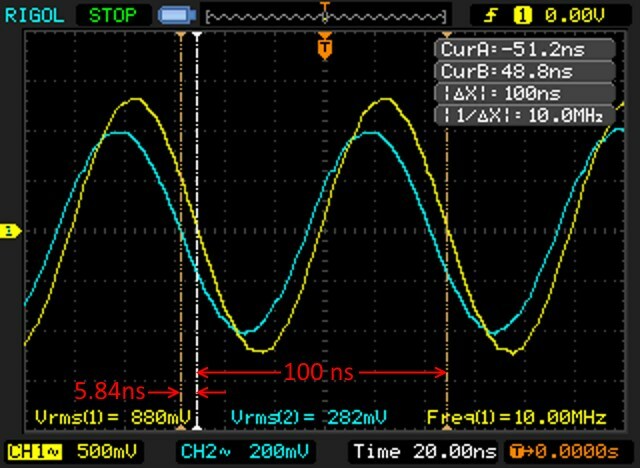 Its value must be as little as possible to limit the impact on the overall impedance of the circuit, but it must be big enough to produce a voltage drop that can be read by the oscilloscope with good precision. The probes should be set to 10x to reduce their impact on the impedance of the circuit. This value is to be specified as negative if measurement from CH1 to CH2 goes leftwards (as in the example above). Below the formulae that are used in this calculator.